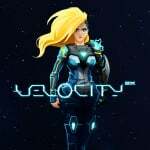 Strictly Limited Games, one of several publishers which specialises in physical releases of fan-favourite indie games, has revealed that it will bring a limited run of Velocity 2X to Switch. The game has you slipping into the role of Lt. Kai Tana, a former test pilot captured by a race of hostile aliens. During her captivity, Kai’s body has undergone various cybernetic modifications and, freed by a precious ally, she must now use her new abilities and the teleporting power of her ship to evade the Vokh and free the universe from this dangerous threat. We thoroughly enjoyed our time with the game in our review, saying that the game offered "an immaculately designed, endlessly replayable arcade experience that shows just how engaging twitch gameplay can be". As you can see in the tweet above, pre-orders start this Sunday, 27th January, and will be available exclusively through Strictly Limited Games' online store. 2,500 copies of a Standard release (€29.99) are set to be published, as well as just 1,500 copies of a Collector's Edition which will cost €49.99. Have you already played this one on Switch? Will you be snapping up any of these physical editions? Tell us below. I might try and pick up the collector's edition and resell it. Hopefully I will be able to send my kid to college with the money. I had never heard of these guys before. So we have yet another company producing extremely limited physical copies of Switch games. Apart from this, Limited Run, Super Rare, Play-Asia, and the site commissioning the Gone Home cartridges, is there anybody else? Limited Run are horrid - if you say one thing wrong, they jump on you like you've murdered a child. Super Rare - an expensive club to order 2 days early is a bad cash in. Play-Asia, I like them, they hardly release anything or make a huge fuss. Strictly Limited - not really sure...just another cash in on collectors. The market is saturated. I sold all my Limited Run/Super Rare when they got angry for saying "seems like a cash grab" and introduced a lousy "club". Shame LRG don't let you cancel, last person I know who did, got "banned for life" lol. Bell-Ends. Finally on the switch!! This is a must have for me. I never picked it up on PSN but I'm glad to catch a physical edition for my Switch library. After Nintendo's today's statement on the development of Metroid Prime 4 I can't think much of anything else. I'm just happy they are putting quality first! Retro Studios is the way to go!!!!!!!!!!! I might pick this up again. It's an extremely fun game. @Silly_G There's also Special Reserve Games, who are going to be doing the Switch limited production releases of Downwell, The Messenger, and Minit sometime this year. Maybe Signature Edition Games, but they do reprint these from time to time and they're published by Merge Games who keeps them stocked. This is only the second game done by Strictly Limited by the way, their first is Fox N Forests. I'm expecting to receive my copy sometime in the next few weeks. I always buy physical if possible but I hate it when they do limited runs of games that you could only buy digitally before. I'm not double dipping. If i didn't have the pS4 physical i would definiyely get this. fantastic game. @nate83km I too think the SRG club is astonishingly stupid - but it doesn't appear to impact standard pre-orders in anyway, so I don't really think it's a major issue. I've also not had any issues with LRG. Granted, I never buy the special editions, just standard pre-orders, so I haven't really had to deal with the instantaneous stock depletion some complain about. At the end of the day, all of these limited releases are done by extremely small companies. It's no wonder it's a bit expensive. They are trying to make a profit after all - and there's plenty of people willing to pay a bit extra for some of their favorite indie games. I don't think that makes it a "Cash grab" any more than any other for profit company. Apart from the SRG Club, which as I've mentioned, I think is incredibly stupid, but it least it doesn't impact standard pre-orders. Take pre-orders instead, and then make enough copies to fullfill all of those orders. I support LRG now they've moved to a pre-order model for switch games and you know you can get a copy if you want one. I did try to collect their vita stuff though and lost out so many times to games selling out while you even got the "buy" option on your screen...only to appear on Ebay seconds later for a small fortune. I vowed never again. Sad another company has popped up feeding the eBay scalper beast. LRG are good, they take a while to arrive because they do the pre-order thing, I guess, but I don't care as long as I get them. Special Reserve are doing Enter The Gungeon at some point on Switch too....hopefully they do the whole Devolver catalog at some point! Velocity 2x is one of the first games I ever played on the PS4 (and also PSVita) so it's nice to have it on the Switch. Most of my other early PS4 gaming was Final Fantasy XIV, a great game that unfortunately will probably never make it to the Switch. I do think it's weird to have all of these different companies doing limited physical releases, and I find the rush and scalping to be extremely annoying - preorders are much better. I also wish the physical version would come with a download code for the eshop version, so you could have the best of both worlds! Another fight for the game and plate....just make is In-Demand orders. That way you know how many really wants it and it stops the Scalpers.